Our Blue Fox has gorgeous blue fur that is long and shaggy with baby blue accents on its paws, ears and snout. 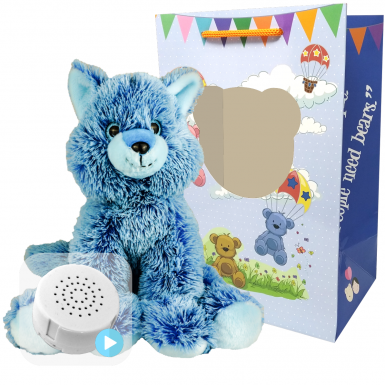 Just record your unborn baby's heartbeat on the 20 second sound module provided and pop it into your Blue Fox allowing you to enjoy the sound of your baby's heartbeat both before and after your baby is born. Each Heartbeat Bear comes pre-stuffed to perfection with our super-soft and cuddly stuffing. On arrival, all you need to do is record your baby's heartbeat on the provided 20 second sound module (the sound quality's great and it can be re-recorded if you're not happy with your first attempt). Once the heartbeat has been recorded, you then place the sound module into your bear or animal and close with our one-way zip closure (don't worry, the fastening is only one-way for little hands) before sealing the outer Velcro closure. Finally press your bear or animal's tummy to hear the heartbeat sound you previously recorded. Full illustrated instructions on how to record your baby's heartbeat are supplied. 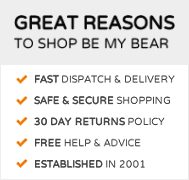 What is a Heartbeat Bear? A Heartbeat Bear or Heartbeat Teddy is a unique memento of a precious moment which allows you to enjoy the sound of your baby's heartbeat before and after baby's arrival. The heartbeat can be recorded on to the sound module during a routine scan, or alternatively from a mobile phone recording you may already have. Once recorded on the provided sound module, the heartbeat can be enjoyed for years to come inside your very own cuddly teddy bear or animal friend. A deluxe carry bag is also provided making our Heartbeat Bear an ideal gift for mum-to-be. Heartbeat Bears are also an ideal gift for baby showers or gender reveal parties. What Does The Blue Fox Symbolise? Usually the fox is seen to symbolise someone who is clever and able to provide the solution to problems through a balance of persistence and patience. The fox also symbolises loyalty and has the effect of drawing people to them. Finally the fox symbolises creative and engaging people who are interesting and find interaction with others easy, taking an active interest in the feelings of the people who surround them.